This is the second of five posts about LittleBigPlanet (for those of you paying attention, yes, I did add one). My first post dealt with the mechanics and deconstructionist nature of the game. Today, I will discuss playing one of the biggest draws of playing the game: playing it with others. I hope to contribute to a discussion about what I confidently call the PS3's premier game, so I encourage everyone to jump in! As Michael Abbott points out, LBP is a game people want to play together, regardless of their gaming habits. I have been playing the game regularly since its release and have played with people whoposses varying degrees of video game experience. Even people normally indifferent towards games seem to like LBP, and I would like to suggest two reasons for this. When it comes to a game's appeal, regardless of gameplay, presentation matters. LBP is a game whose style and high-quality workmanship is intuitively apparent to anyone, regardless of their video game knowledge. As Michael elegantly states, "this game was lovingly crafted by human beings." Most importantly it is also a game crafted for human beings, in the sense that the game's appeal is not beholden to any specific group of people. Because the players have so much control over the look and structure of both Sackboy and the levels, the game can be sappy or serious, cute or homely. The imagery may be fantastic, but it is also technically impressive. At the risk of getting overly metaphysical, I argue that LBP is a game that feels comfortable in its own skin. Its presentation suggests an earnestness behind its development. LBP is not a game designed by focus group testing; it is an organic artistic vision created by people who shared a vision. Nothing in the game is "accidental." Each minute detail, whither it be a color, shape, animation, or sound, conveys a sense of deliberation. Even so, the game avoids feeling overwrought. Too often, games seem to be "trying" for something rather than actually "being" something. For me, the difference between the presentation ofLBP and the presentation of Gears of War is that Gears goes out of its way to remind you that you are a marine in dystopian future at every turn: "See, look how much they swear! Look how buff they are! Look at how everything is cracked and grey! This is EXTREME!" Of course, this feeling is extremely subjective, and I do not think "trying" is always a bad thing (I should point out that I like Gears, by the way). LBP exists quietly and confidently, which is why I think people are drawn to it. LBP fosters an intuitive attraction in people, and it is only natural to want to play the game with others who share the attraction. LBP offers something for everyone, regardless of where a player falls along the spectrum of Mitch Krpata's New Taxonomy of Gaming. LBP's implementation of gameplay makes cooperative gameplay essential for any type of player to derive full enjoyment of the game. Tourists: LBP is an excellent game for folks just looking to see the sights. The developer worlds are clever, and the player created levels mean the sightseeing never has to end. But, to see all the best, most impressive levels, Tourists benefit from cooperation with bothcompletionists and perfectionists. The occasional helping hand through a difficult level, or the favorites list of a veteran player allows tourists to experience the game's highlights. Completionists: Completionists will enjoy the respectable chunk of time required work through and unlock all of LBP's story mode levels. Because it is possible to do this alone, one can argue that completionists benefit the least from co-op in LBP. However, can one say they have "completed" LBP without experiencing the mayhem of four players on the screen at once? Is one's experience "complete" without playing the magnificentIco-themed level? LBP is a game with the potential to reinvent itself indefinitely. Large-scale communal cooperation benefits completionists : people who are basically level story mode tourists can still spend hours creating levels. Perfectionists can implement their hard-won items when creating new challenges. The dynamic between people creating and people playing continually refreshes the game for players of all styles. Perfectionists: The scoring and ranking mechanic in LBP caters directly to perfectionists. While completely optional, the scoreboard acts as a constant motivator for those wishing to master the game. Items are unlocked for passing levels without dying, and each level has a item-collection percentage that goads perfectionists onward. Cooperation is ingeniously worked into the perfectionist's play experience: in order to attain 100% on a level, you must work with other players. Some puzzles require as many as fourSackboys to solve. As it is unlikely that four perfectionists will be playing at the same time, the perfectionist relies on both completionists and tourists to fulfill their objective. 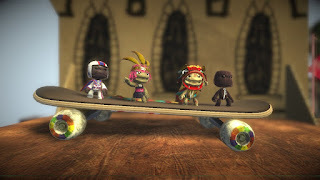 LBP succeeds as a cooperative game because its presentation lures a wide variety of people into its world. Once in the world, players rely on one another to fully realize the kind ofgameplay they enjoy. Tourists have a beautiful world full of guides to point out the highlights, completionists have a self-perpetuating game built by their fellow players, and perfectionists can embark on a grand treasure hunt that necessitates the help of friends. "It forms a world, an ethereal dreamscape of adventure and possibilities. An abstract plane of beautiful wonderment, just waiting to be explored." I definitely fall in the tourist category. The game's subtle markings for informing you only two sackboys can reach a portion of the level is the challenge to the explorer side of me.